Traditional 100% pure henna is SAFE! 100% pure henna stains skin in some color between orange, red, burgundy, brown or coffee. The FDA classifies 100% pure henna as so safe for hair that it is exempt from regulation. Traditional pure henna rarely causes any difficulty on the unbroken skin of a healthy adult. Henna should NOT be used on infants, or children known to have G6PD deficiency. Click on links for more information! Click here for more information on safe, traditional henna. See below for additives that should be avoided. and is often NOT SAFE! Do you want to use "Black Henna"? Artists who use PPD based "Black Henna" put their health at risk. Do you have a "Black Henna" tattoo that's starting to blister and itch? You've been sensitized to PPD, para-phenylenediaime, and you MUST go to a doctor! Henna is NOT black. If someone offers you something called "Black Henna", it is NOT henna. If someone has something that stains skin black, it is NOT henna. The black dye is probably para-phenylenediamine, also known as PPD, and that can hurt you. PPD, or para-phenylenediamine is a snythetic coal tar dye, and causes severe reactions in some people. Want to see pictures of how miserable this is? The International Chemical Safety Card for PPD gives a clear indication of how dangerous it can be and how utterly inappropriate it is for skin application. If your "Black Henna" tattoo is starting to itch and blister GO TO A DOCTOR! NOW! How do you know if what you see is "PPD Black Henna"? PPD paste is jet black. Ask how long it takes to stain and how long it lasts. If the answers are "just an hour or two" and "a week or more", it's PPD. Ask what colour it will give. If the answer is "pure black", it's PPD. Ask to see an ingredients list. If the artist can't supply one, or you don't like what you see, walk away. PPD is not the only ingredient used to make black henna. There are also other chemical dyes in use, but none of them stains as fast or as black, or lasts as long as PPD. Some of these dyes may be safe, some may not. Ask to see an ingredient list. If you're not comfortable with what you see, don't use it. Don't do a skin test with PPD "black henna". Your skin might not react to PPD the first time you use it. Since the reaction can take three weeks or more to show, or in some cases appears only after a second exposure, it is not safe to assume that a 24 hour skin test is going to tell you if you are sensitive. It will only make you more likely to develop a sensitivity. Just don't use it at all! The International Chemical Safety Card recommends the wearing of protective gloves and protective clothing when handling PPD and warns "Exposure may result in death". Do you really want to put this stuff on your skin? Do so and you might find yourself in the same situation that Mandy or Thomas did. Or Brian, or Noelle, or Allan, or Michelle, or Sarah, or Alan, or Debra ...... I hate having to add names to this list. However, I was very pleased to see one success story. If you follow this link, do read through all the follow-ups. It will give you some idea of the depth of feeling there is about this subject. More information about PPD is available. Pure Henna is SAFE. Pure henna has been in use for thousands of years. 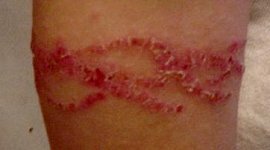 It's one of the safest things you can put on your skin, and reactions are very unusual. Henna is NEVER blue, yellow, green, purple or black. If a product stains skin those colors, it is NOT henna. Those stains come from other dyes. Ask what dyes those are. If the supplier can't or won't tell you what dyes those are, and prove it, or you don't like the sound of what they tell you, don't put the stuff on your skin. Smell the product. If it smells scary, don't put it on your skin. Artists often add essential oils such as Tea Tree, Eucalyptus, Cajeput and others to henna paste to "terp" them, and make the stain quicker and darker. If these are from aromatherapy grade essential oils containing monoterpene alcohols, this is a safe and effective way to make henna very dark. Many of these give wonderful results, are fragrant and harmless. Some may cause minor skin irritation. See: http://www.hennapage.com/journal/issue_III/article_3/page1.html and http://www.mehandi.com/how/howmix/howmixi7.html for complete details on safe and effective use of essential oils that have high levels of monoterpene alcohols. Some henna artists in India, Africa and Arabia use acetone, lighter fluid, turpentine, gasoline and dry cleaning fluid in their henna mixes to get near black stains. This is DANGEROUS! If you smell these solvents in henna paste, do not put it on your skin. If it's already on your skin, wash it off as quickly as you can. 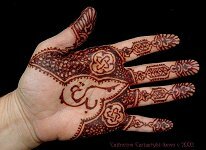 Some Indian henna artists use camphor, or white flower oil (which includes camphor) in their henna to make very dark stains. Camphor may make both the artist and client nauseous, dizzy, intoxicated or very ill. Do not put camphor or products that include camphor in henna paste. Citrus oils can darken henna, but they can also leave itchy welts on the skin, or increase sun sensitivity. If henna paste smells like lemon peel or citronella, it may make you itchy. Some people include walnut powder in their henna mix to help darken the stain. Many people are allergic to walnut and this may cause a rash on their skin. If they are very sensitive, there is a risk of inducing anaphalactic shock!. Always ask clients if they have a nut allergy before applying walnut powder paste to their skin. Or play safe and leave it out of the mix. This is not henna. However, it is dark brown dye which contains ingredients that may cause skin irritation. Someone, somewhere, in the supply chain in the Middle East is selling a solid form of industrial grade PPD and is lying about what it is. There is no such thing as a black rock that will make henna black. There is no such thing as a "henna stone". These are lies told to gullible people by someone who wants to make a huge profit on PPD. If it's black, stains quickly and stays black for more than 4-5 days, its PPD, and it can hurt you!